A couple of weeks ago I got an e-mail from the nice people at Sainsbury’s, long-time supporters of Comic Relief, asking if I’d like to take part in their Red Nose Day Cookie Challenge. The idea was that to celebrate the 25th anniversary of Red Nose Day, I and others would bake and decorate a ‘comedic cookie creation’. Sainsbury’s would choose their top five favourite designs as finalists, but the eventual winner would be chosen by the votes of Sainsbury’s 610,000 Facebook fans. I said yes without really thinking and found myself struggling to come up with a design. I decided that creating a cookie that looked like a Red Nose would be far too obvious and that I needed to find something a little more ‘off the wall’. I took inspiration from one of the starters that I had previously seen on this year’s Great British Menu, and so ‘Beans Means Dosh’, as I call it, was born. 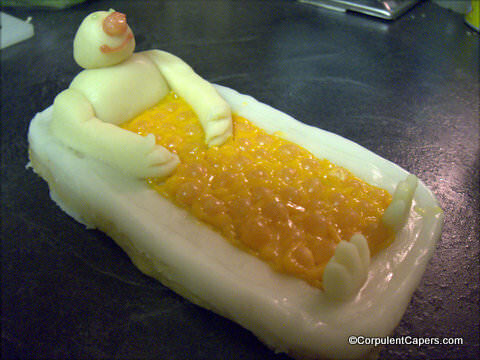 My design, is supposed to depict that age-old fundraising favourite of sitting in a bath of baked beans. First I went looking for a cookie recipe, in the American cookbooks we have in the cupboard. All the American cookie recipes seem to contain egg, which I decided must be there to help with the chewy consistency they prefer. 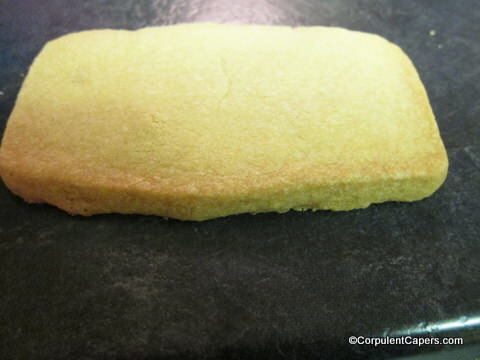 As chewiness was not something I was looking for I decided to fall back on my standard plain biscuit recipe, a kind of not so short shortbread. I baked three different sizes of cookie for the bath; I ended up using the middle sized one which measures approximately 17cm x 8cm. The large one was too fragile and broke and the small one just looked completely the wrong scale. 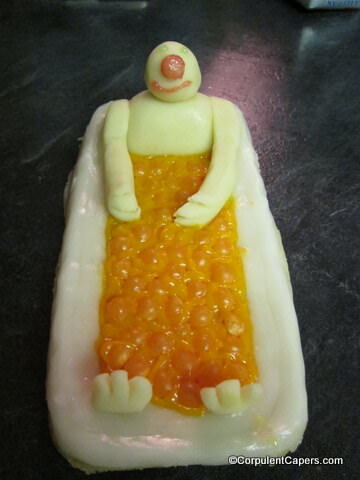 I built the bath edging from white icing, the figure was constructed from marzipan and the baked beans the cut off ends of orange jelly beans from the supermarket pick and mix. I used a tube of orange cake decorators icing to fill in the gaps. I have included the recipe below, together with instructions, should you wish to give it a try yourselves. Alternatively you can buy mine for a suitably sized donation to Comic Relief. Or you can just buy ready made icing in a tube. In a large bowl, cream the butter and until it is soft (you can use a food mixer) Add the sugar and beat until light and fluffy. Sift the flour into the mixture and using a figure of eight motion bring it all together to form a dough. Shape into a ball using your hands, wrap in clingfilm and pop it into the fridge for 20 minutes to rest. Carefully lift the dough and place onto a greased (I use butter) baking tray in the center of your oven for 15 to 20 minutes until they have a light brown colour. As you have plenty of dough I would suggest making at least two cookie bases. Roll any left over dough into 3cm balls, flatten with the palm of your hand and bake as simple biscuits. Just make sure that you leave enough distance between everything on the baking tray to allow for expansion. Carefully remove from the baking tray and allow to cool on a wire rack. The icing should be thick enough to coat the back of a spoon. If it's too thin add more icing sugar, if too thick a few drops of water. Either way do it a little by little. If you have made your own icing now spoon it into a piping bag with a flat nozzle. You might find it easier to put the cookie base on a small board to make it easier to handle and rotate. First build the bath edges from your icing. Using a flat nozzle pipe icing around the edge of the base. Once you have completed the first layer you can then pipe another one inside the first so your edge is 2 wide. Then you can repeat the process on top of the first layers. I did three layers on mine. You can smooth out the edges by dipping the tip of your finger in a glass of water and smoothing the icing. 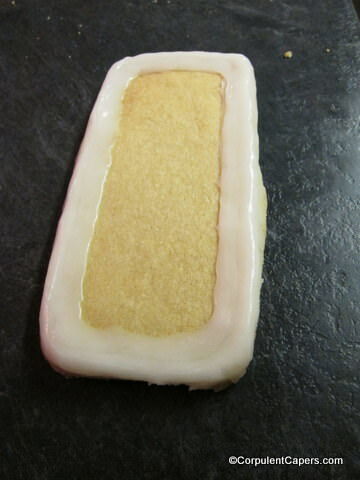 Cut off a piece of the marzipan and form a block approximately three quarters of the width of the distance between the bath edges and about 3cm high. This will be the body. 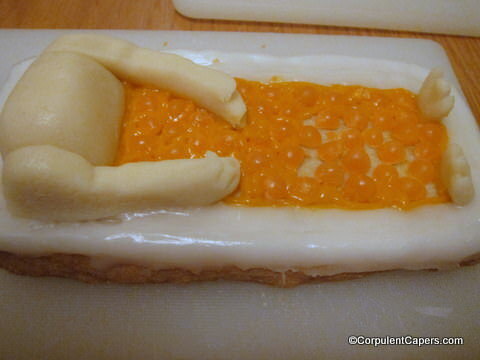 Take two smaller pieces of marzipan and roll to form the arms (see picture). I used a knife to make 3 small cuts into the end of the arms to give the illusion of hands. Take another two small pieces and flatten for the feet. Again make some cuts to imply toes. Stick all these pieces onto the base using some of the left over icing. Using the orange writing icing outline the inside edge of the bath also tracing round the body, arms and feet. On a chopping board and using a sharp knife cut the ends off the jelly beans so that you have a lot of small orange domes. These will be our baked beans. 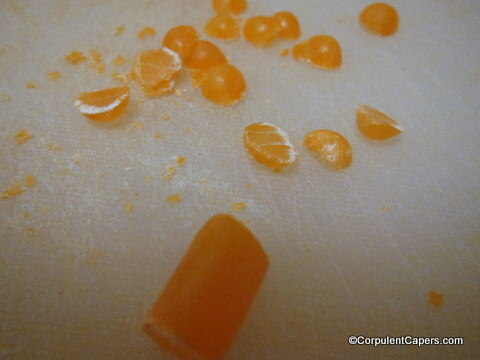 Using a drop of the orange writing icing as a glue stick these domes onto the base to fill in the space. Then using the orange writing icing again, fill in all the gaps between the jelly bean domes. 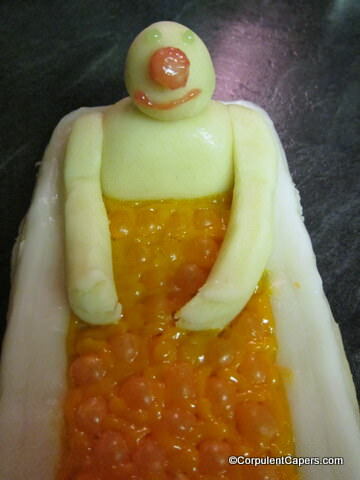 Finally make two further marzipan balls, one for the head and one for the nose. Stick the nose onto the head using the icing. As my writing icing also contained red, green and yellow tubes I coloured the nose red, for obvious reasons, added a stripe for a mouth and two small dots of green for eyes. 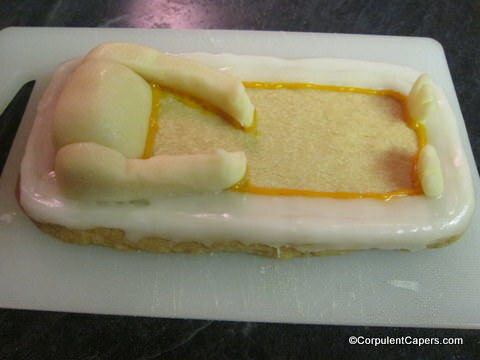 I then stuck the head to the body again using the icing. That is amazing! I hope you win. You get my vote!